An original Alexander Love design. 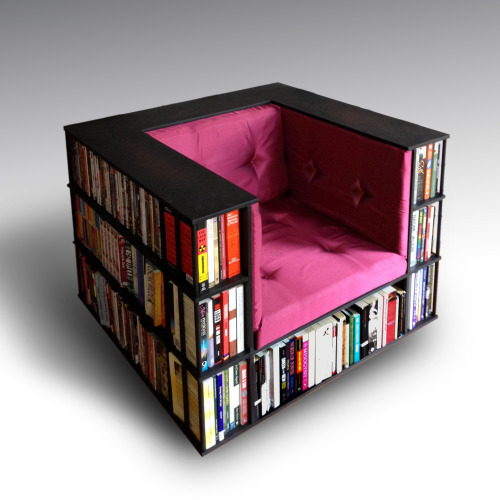 Combining the old school appeal of a ‘club’ chair with a modern and eminently functional design, there are almost 27 feet of book shelf space as well as a concealed compartment under the seat to hide your secrets. 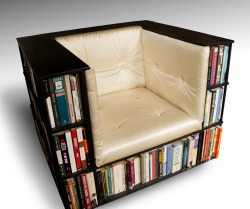 The button-cushion upholstery provides a very comfortable deep seat, perfect for sitting and reading, enveloped by your library! On rolling castors for easy movement. Can be upholstered in any material and painted in any color. Stained veneer available on top shelf at additional cost.